This challenge got me to thinking about my phone. I take lots of pics with my phone and my camera roll looks like a mosaic (though there's no shape). I wanted to convey the idea that with technology today we can capture everything we see. The photo is made up of about 5 different mosaics of various sizes all cut and layered differently. The main pic was taken with a Canon Rebel XSI, Off camera flash set behind two colored glass vases and a tripod. I was making dinner enjoying a Martini when the idea came to me to use the drink as a subject and the contents of my bar as the structure. When inspiration calls you listen, so I grabbed my camera and while my dinner sat out getting cold I started taking pictures. The main shot was taken in low light with my Nikon D60 at f/22, ISO-800, for 8 seconds. The shots that make up the content were cropped to be only the labels from the bottles. I used MOSAnICK for the composition and after a few tweaks of the settings I liked what I had. The subject is one of our 6-month old kittens, Luna. She loves posing for photos. I had some great light when she was on her perch in front of our bedroom windows. I decided on this because of the detail I wanted to reproduce with the mosaic. I've done these before and found to really crank up the amount of images you use and you'll get a better result. This mosaic was created by MacOSaiX and I sourced my iphoto library which used around 5,200 images to fill up 8,800 tiles. I am very pleased with the resulting image. In the past I've used the original source image to overlay in photoshop to bring out the final product, but in this case the final image was perfect, no retouching to the final image was done. I shot this with a Nikon D3100 with the 18-55mm kit lens and a .45x wide angle adapter. 1/1000, f5.6, ISO 800, 55mm focal length. The images used shot with different lenses and cameras, all are shot by me. I forgot what I was looking for when I realized that I have a lot of old computer junk that needs to be thrown away. It is difficult to get rid of stuff that has nostalgic value, but it might be easier if I had a picture of it. This was a perfect time for this challenge. I shot all of these photos since the challenge began. I took pictures of a lot of my equipment. Included in these images are pictures of 3-1/2" floppies, 5-1/4" floppies, a TRS-80 Model III, a Timex Sinclair, a TI-99 4A, various CDs, CRTs, Monitors, Modems, Hard Drives, PIC programmers, BASIC Stamps, computer books, printers and much much more. All of these pictures where taken with a Canon XTi and a Sigma 50mm 1.4 lens. A most interesting challenge. I have often wondered how photo mosaics were produced. After reading the challenges I went and downloaded AndreaMosaic. My sons and I were discussing the challenge with my brother trying to come up with an idea of what to do. I was thinking of a sunset made of sunsets, but my brother remembered this picture I caught in my back yard of an Apache Jumping Spider (a yellow/orange and black spider) on the branch of a bush. That photo was taken with a Kodak V610. Using 77 shots of the sky, mostly taking with my Cannon EOS Rebel T2i, and AndreaMosaic I created a mosaic of the spider. This is a photo of a classic Chicago deep dish pizza from Giordano's, made from 1,032 pictures of various tourist spots in Chicago. I happened to be in Chicago for the first time on a mini vacation when this challenge was announced which definitely made my choice easy since I had been walking around snapping pictures of everything in Chicago for three days leading up to this. The only thing I had to worry about was the lead picture, so I let my belly take care of that for me. If you've never had the pleasure of downing one of these bad boys, I highly recommend it. This photomosaic is of my dog, Kona. I thought it would be a neat idea to create this out of the pictures I've taken of him growing up. My wife liked this so much that she wants to have a large canvas printout done so we can hang it up inside the house. Most shots including the main photo taken on a Canon S5IS. I wanted to get some close-ups this week anyways but I got him to sit still long enough for this one in a high chair between spoonfulls of green goo. Tiled in Andrea Mosaic - 1600+ photos spread out to 2000 tiles. Since I began shooting my "365 Photo Project," I've come to realize how much I really love my camera. Here is my visual ode to thee. The subject of my mosaic is my old DSLR, acting as a stand in for my 7d which I used to take all the filler shots. The tiles here are all made up of the items in my camera bag, which include speed-lights, flash diffusion, a 50mm, cables, a points and shoot, filters, a charger, an intervalometer, and my second body. All photos taken with my 24-105, and I used a couple of different exposure settings to get darker and lighter images. I used MacOSaix and Aperture to process the image. My roommate now thinks I went crazy and I'm selling all my gear, but I think the end result is worth it! I took all the pictures while on vacation in Seattle, WA. The Subject is of course the Space Needle (3/24/11) the source images are all taken while I was there from 3/20/11 to 3/25/11. The images are from La Push, Hurricane Ridge, and Seattle. The Seattle images are from the Woodland Park Zoo, Pacific Science Center, Space Needle, Seattle Harbor, Hard Rock Cafe, Pikes Place Market, and the Seattle Aquarium. I had taken around 500 pictures while there and thought the Space Needle would be a great Subject picture. This is my first attempt at one of the contest and considering I used only an iPhone 4 I'm sure I'll be outdone but figured it would be worth a shot. The Closeup shot of this horse was taken on with a D300 at 12mm Shutter 1/250 F4 and 200 ISO. I had to go so close, that the horse licked my Lens hood. Happily it did not bite in it. We are what we read. Our image of the world is derived in large part by what we read. The image of this reader is composed of the covers of the books in his library. The main photo was taken with a Canon 60D in aperture priority mode (to keep the background out of focus). 1/13th second exposure at f/5.0, ISO 100. I was reading the largest book we have ("The Birds of America" by John James Audubon, 1937) by a west-facing window. My girlfriend composed and took the picture. For the mosaic tile pictures, I used my Canon Powershot S90 (set to take low-resolution pictures)and took a picture of very nearly every book in the house - 377 pictures in all. AndreaMosaic was the software used - used 2000 tiles, 30% color change, parquet (one landscape, one portrait) pattern. This mosaic is made from photographs of students at the school I teach at. The photos have been placed into a mosaic image of the schools emblem, a symbol of the students, the wider community and how we work together towards the future. It seemed fitting to use individual photos to the students to create the mosaic of the school emblem as it is a symbol of the students and the school is whatever the students make it. I get to spend Saturdays with 8 hours to kill virtually alone in a 7 story office building which means there are a lot of empty cubicles. Some messy, some tidy, all a bit sad...but perfect subjects for a mosaic I concluded after a few days of deliberating over the usual suspects I've done in the past. After walking floor to floor snapping shots of about 80 moderately personalized versions of soul crushing hell (I kid..job security and all...) I went out to the plaza and took the main shot of the entire buidling and put it all together in Andrea Mosaic. Layered the original on top and masked off the building in PS (hope that still counts given that the entire shot isn't tiled...?). A cold outer facade of windows that instead of reflecting the outside world now offers a scattered glimpse into what lies within (ha! how's that for snobby poetic photographer cheese?). Bonus points to anyone who recognizes the building (hint...in the Northwest somewhere) and super bonus points to anyone who can identify which cubicle is mine. I searched and searched to find the shooting challenge for the week after the posts for the strobe shots came out. "Frustrating" After way too much time looking I found this shot for a mosaic challenge. However, I am really not sure if it really the challendge as there is nothing posted on facebook and I can't really find it the Gizmodo site. But I did find a challenge with the date deadline of Monday March 28 (year?). I was able to download Mosaic Creator and mess with if over the past few days. I have created no less than two dozen mosaics using just two main images, all created around baseball as I have the most pictures of baseball. In messing with the program I have found what not to do and what I like. For this shot I used the softer features to blend the individual pictures so the viewer can see the original image, which is my son pitching. The first pictrue I created was with all the baseball pictures from last season. This Saturday I was at the game taking pictures and was able make this shot with just the days worth of pictures, 636. A double header. All pictures taken with sport shot on a Canon Rebel T1i, most shots were with a 55-250 kit lens. The underlying image is an extreme close-up of a puppy. This picture was haphazardly taken when our Alaskan Malamute was 7 weeks old. His name is Lupo, which means "wolf" in Hawaiian. He's the size of a small bear and very wolf-like. He enjoys eating the couch and the carpet. Sometimes we don't understand each other. The library of images compiled as a mosaic overlay is made up our life together, hence the name, "A Dog's Life." With the challenge being a Mosaic I first had to decide a subject that I had many pictures of. I chose Redskins football since I have taken many pictures at football games. I then chose a football in grass to be my main subject. I took a football in the yard and took a picture using a canon 60D. I then used AndreaMosaic to combine the 1761 unique pictures taken from my a few years of attending football games (Olympus E-500). After many trials and changings settings I decided to make the mosaic out of 10000 pictures in order to get the detail I wanted, and did not use a single picture more than 30 times. I also decided not make sure the program did not alter the color of the photos to make it natural. This is a mosaic based on a photo of my Nikon D7000... Comprised of over 1,200 un-duplicated shots I've taken since January 1st with said Nikon. I've been working on a photo-a-day project this year in addition to all of my clients' work, so I figured this would be a fun way to combine a lot of the year's progress. I used AndreaMosaic to process the whole shebang. This is a picture of my 3 year old daughter. I've never done a mosaic before, but I thought it sounded like a fun project. What I did was to load the mosaic software (MOSAnICk) with pictures that represented everything that has directly or indirectly contributed to her development. That includes pictures of her parents, older sister, grandparents and other relatives, friends, pets, parties, vacations, etc. The idea is that she is the sum of all those "parts." I loaded probably in the neighborhood 5,000 pictures for the software to use to find the best fit for each block. My daughters were excited when I zoomed in, and they could see the individual pictures. I took this picture while chasing a turkey (a story for another time) in a residential area, and I saw these bright yellow flowers in a front yard. So I took a picture of the flowers instead because the turkey which I was originally trying to take a picture of had flown out of sight. The details of the flowers didn't come out so sharp in this Mosaic, but in the end it reminds me of a puzzle. Thus I named this pictures Spring into Pieces. I used MozoDojo to create the moasic using my iPhoto library of pictures. I think it's so neat how all these other picture that I have taken over the year have come together to recreate a single picture. I can look at each individual picture and recognize how it is used to piece together this puzzle of an image of yellow flowers, hope you enjoy viewing this pictures as much as I did creating it. Here is a list of the equipment and specs that I was using: Canon EOS 7D, 50mm 1.4 lens, f/1.4, exposure 1/200, iso 320, White Balance: Daylight, and created/taken March 20, 2011 5:56PM. I was a little skeptical when i saw this photo challenge but then I had a couple ideas that would work perfect. Since most of the photos I have from the past several years are from Traveling I wanted to do a travel theme. This is a photo of my bookshelf of travel books with a mosaic of all the photos that were taken while seeing sites from the books. 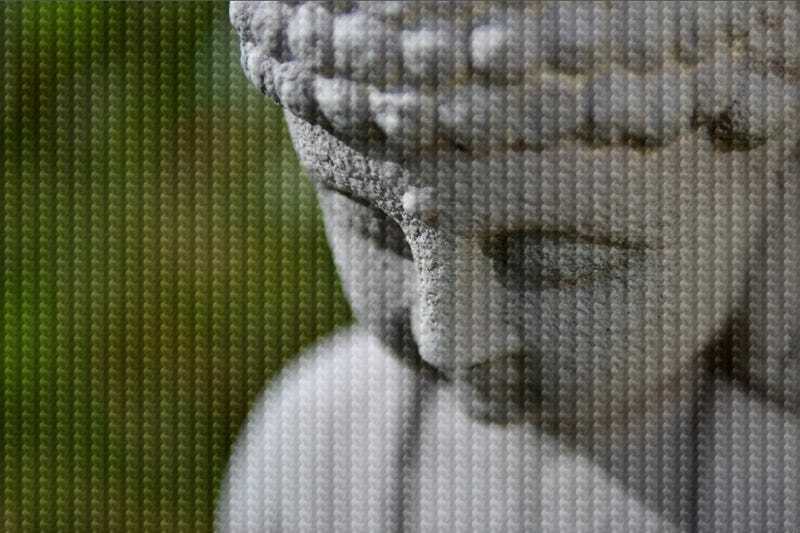 I used Mozodojo to create the mosaic. My mosaic shows the "7th Man" banner that hangs in the Bridgestone Arena in Nashville, TN - home of the Nashville Predators hockey club. All of the photos used (1,636) were taken on Saturday, March 26th during the game against the Dallas Stars. The Predators won 4-2 and the fans were, indeed, the 7th man on the ice. Photos were taken with a Nikon D90 using a 70-300mm f/4.5-5.6G Nikkor lens. Image was produced with MacOSaiX set to 100x100 tiles. Let me say this ... despite being in the arena for almost 3 hours, it isn't that easy shooting 1,600+ images. You always make a wonderful job naming the photos I send you but this time it's pretty obvious: "You are what you eat"
The tiles are all the pictures of food i found on my computer + some more I took this week, cropped to just show the food itself, without the plate or any surroundings. Various cameras, various locations, various nomz - 87 in total. To give the mosaic app - MacOSaiX - some more data to work with, I've duplicated the images, rotated them and applied random color corrections (without any fancy "batch random" operation, just clicking like crazy). The main picture is me, eating a toast! Shot with a D3100, at 34mm f/6.3, 1/160 sec ISO 400, not that it matters. I took some pics of my wife yesterday before we went for an event and I used all the photo's in my photo library as the Source images. 2000 Images @ 300 DPI.